So here is how it works. It starts now and ends on Sunday, December 2, 2012. Winner will be chosen at random. All you need to do is leave one comment to entered in the giveaway. Please check back to see if you have won. Winner will be announced here, on Google+ and on Facebook, and I will contact you by email. Make sure you leave your email so I can contact you if you are the winner. Winner has 2 days to respond to the email with their address. If I don’t hear back in 2 days, another winner will be announced. The giveaway is for America and Canada only, due to shipping cost. Disclaimer: The gift is provided by me. I was not financially compensated in any way for this post, it cost me money instead, and I was happy to be able to do it. I love Ina Garten's cookbooks alway's well thought out full proof recipes. Wow, it is such a wonderful gift from you to give to your readers! It shown that you care so much for them! It is the thought that counts and thank you for your thoughts! Lovely! 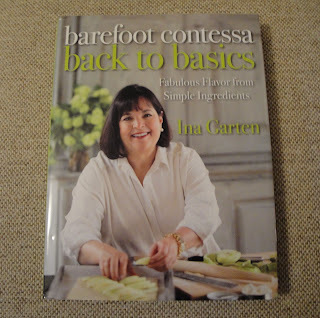 Always wanted an Ina Garten cookbook! What a great giveaway! Ina's books are fantastic and whoever wins this cookbook is definitely in for a treat! Thank you!! I just discovered you thanks to the Google+ Foodies circle. My wife and I have already decided we are having beer goulash for dinner tomorrow! Thanks for all the fantastic recipes and educational tidbits. I have a feeling this is going to become one of my go-to sites for fun new meals. I'm glad you found me. I love Google+. Also glad that you all have decide to make Beer Goulash. Enjoy the rest of the weekend. Thank you so much! Would love to have this cookbook. Thanks for the giveaway. Thank you for this opportunity. I love Ina's books and her style of writing recipes. Happy Holidays! !